When I was little, my parents would take me across the ocean to spend time in their home country of Greece where I would relish in the deliciousness of my Grandma’s homemade egg noodles steeped in brown butter and topped with grated homemade Mizithra cheese (like a parmesan, but softer and more pungent as it’s made from goat or sheep’s milk). My yiayia would always send some dried chopped noodles home with my mom, but just they weren’t the same as the fresh noodles we ate in Greece. 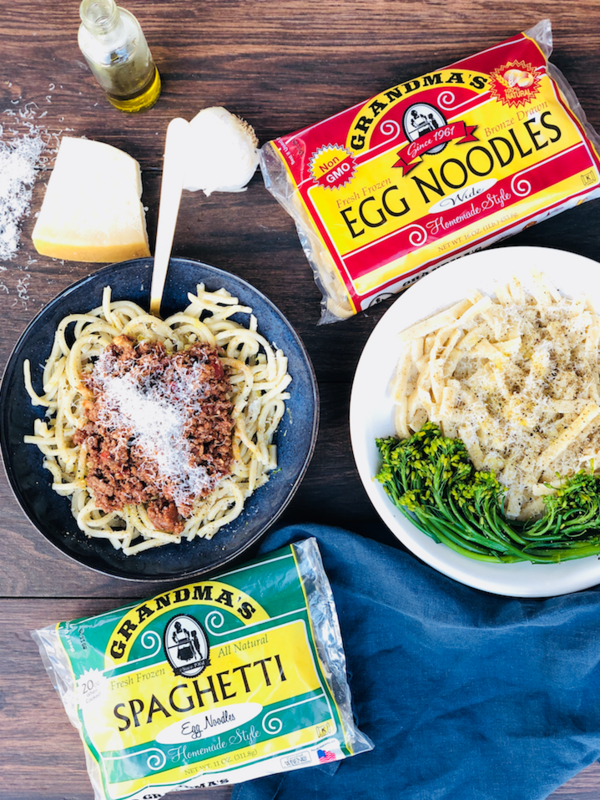 I was recently introduced to a Colorado-based homemade egg noodle company, Grandma’s Frozen Egg Noodles, and I was instantly transported to my 10 year old self back in Greece, eating my yiayia’s egg noodles and savoring every bite. 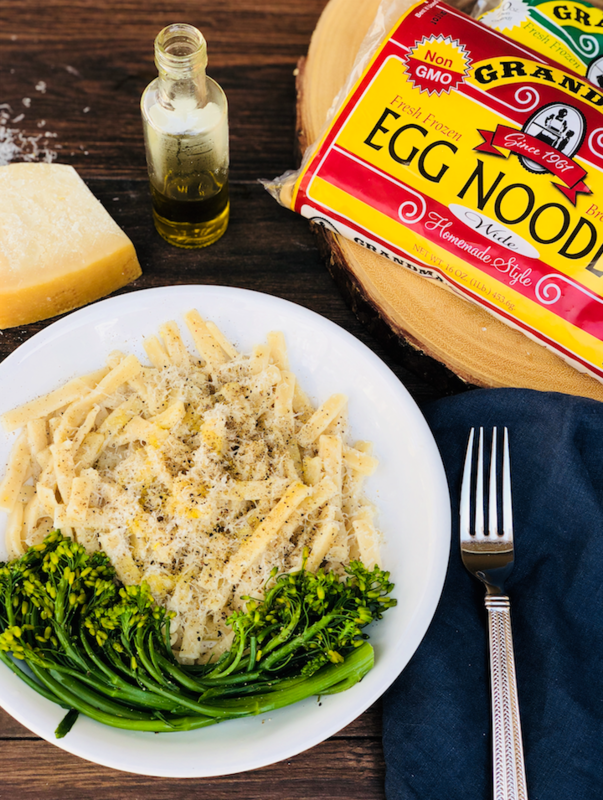 The homemade-style egg noodles are made with 100% natural and non-GMO ingredients using a traditional egg noodle recipe that has been handed down through the generations. Grandma’s Noodles is a family run company headquartered in Arvada, Colorado and they have been making homemade style egg noodles using the same pasta/noodle making machines and techniques that came over from Italy in 1961. So if you want authentic Italian egg noodles, this is it! The frozen egg noodles are available in a wide style egg noodle and also in a thinner spaghetti style egg noodle. This is not your typical spaghetti – it’s an egg noodle in the shape of spaghetti, and has an altogether different flavor. The egg noodles are thick, have a good bite to them and absolutely delicious. They hold up well to even the thickest Ragu or Bolognese sauce you can dream up. Both egg noodle varieties are made with all natural, non-GMO ingredients including bronze-drawn enriched flour, pure filtered water, whole eggs, salt and annatto. The noodles are packaged in 11 oz package of spaghetti egg noodles or wide noodles that yields 20 oz of cooked noodles. There is also a 16 oz wide egg noodle package available, which is perfect for a family of 4-5. The Grandma’s Spaghetti Egg Noodles have 170 calories per serving, 1 gram of fat, 33 total carbs and 7 grams of protein. 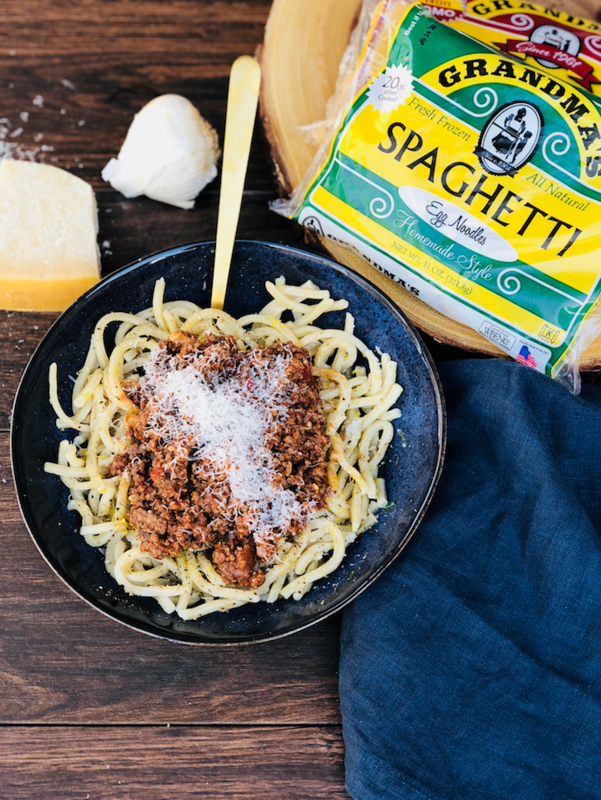 Perfect for using to make Chinese-style egg noodle dishes, or topping with your favorite meat sauce, these spaghetti egg noodles are delightful. I will say these were a milder egg noodle for me, whereas the wide egg noodles have that distinct homemade egg noodle flavor you know and love. While Grandm’s Egg Noodles are not wavy, I don’t recall my yiayia’s egg noodles to be wavy either. These noodles are unique because they are thick cut, which allows them to hold that egg noodle flavor better than other egg noodles on the market. Grandma’s Wide Egg Noodles have 170 calories, 1 gram of fat, 33 carbs and 7 grams of protein. These noodles are perfect on their own as buttered noodles, in a chicken noodle soup or casserole, or as a side to a rich beef short rib. That’s how my family loves them anyway! Frozen Egg noodles must be prepared with patience. Because the egg noodles are made fresh and frozen fresh, they are stuck together when you purchase the package. The frozen egg noodles need time to thaw for about 15 – 30 minutes and separate the noodles before cooking. If you just place the frozen noodles in the pot of boiling water, they will stick together and come out in a large clump. Anything worth doing must be done well – so be sure to allow enough time for the noodles to thaw and separate. The spaghetti noodles took about 17 minutes to thaw and separate, while the egg noodles took about 22 minutes for me. Add the thawed and separated noodles to 3 quarts of boiling water and cook for 12-15 minutes. Drain and enjoy in your favorite pasta recipe. 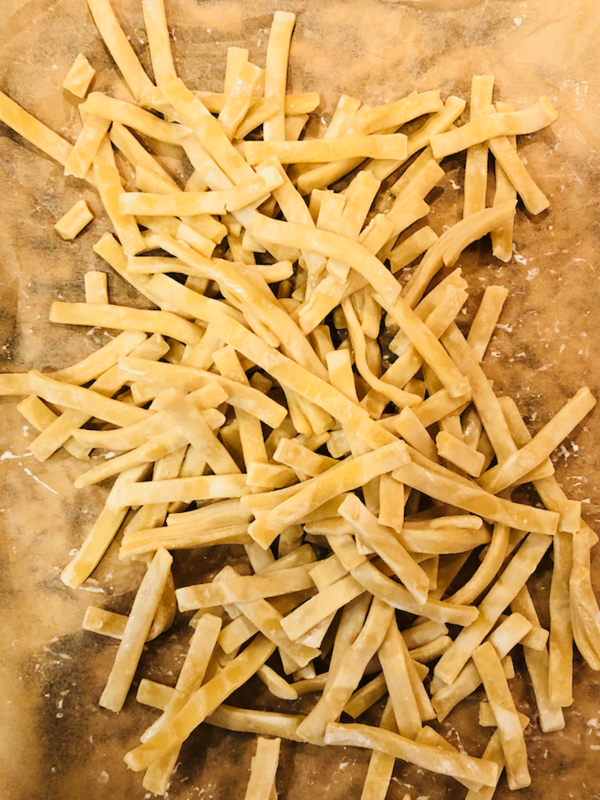 Use Grandma’s Egg noodles in any recipe that calls for egg noodles – my personal favorite way to eat them are with butter, a touch of olive oil, salt, freshly cracked black pepper, shaved lemon zest and freshly grated parmesan cheese. The possibilities for using egg noodles are endless, chicken noodle soup, egg noodle casserole, egg noodles with fresh herbs and feta, tuna noodle casserole, stir-fry Chinese egg noodles and more! There are some fabulous recipe ideas for Grandma’s Egg Noodles on their website here. You can find Grandma’s Frozen Egg Noodles in the freezer section of your local Safeway store next to the frozen raviolis and garlic breads. 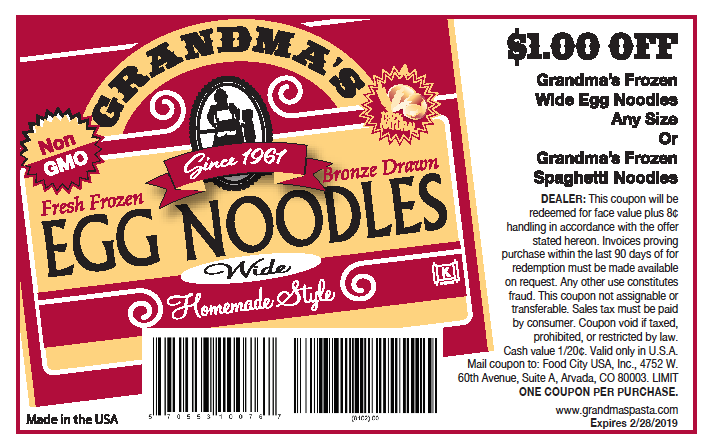 We have an exclusive new $1.00 off 1 Grandma’s Egg Noodles Coupon available to print and use at Safeway. Right now Grandma’s Egg Noodles are on sale for $3.49 through February 3rd. Pair the sale with the new coupon and you can get an awesome value of just $2.49 for the homemade Grandma’s Egg Noodles. Be sure to give Grandma’s Frozen Egg Noodles a try and let us know what you think in the comments below. This is a sponsored post on behalf of Grandma’s Egg Noodles to introduce you to their noodles. As always opinions are my own. We appreciate and encourage your support of the brands that make this site possible.